Smart Code Editor: The code editor provides syntax highlighting as well as code completion. Qt4 Project Generating Wizard: This wizard allows the user to generate a project for a console application, a GUI application, or a C++ library. Qt Help Integration: Qt's entire documentation can be accessed easily by clicking on the Help button. 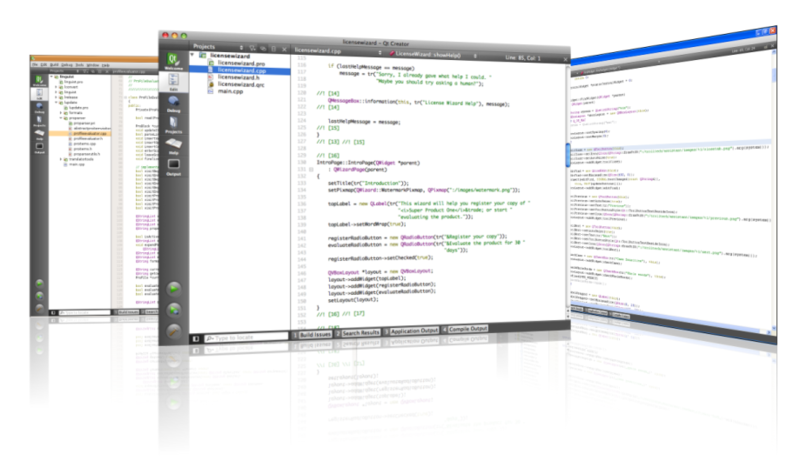 Qt Designer Integration: User interface forms can be designed within Qt Creator. Simply double-click on a .ui file within the Project Explorer to launch the integration. Locator: A powerful navigation tool that lets the user locate files and classes using minimal keystrokes. Support for qmake's .pro file format: The project's .pro file is used as a project description file. Debugging Interface: Applications can be debugged within Qt Creator using a graphical frontend to the GNU symbolic debugger (GDB) and the Microsoft Console Debugger (CDB).